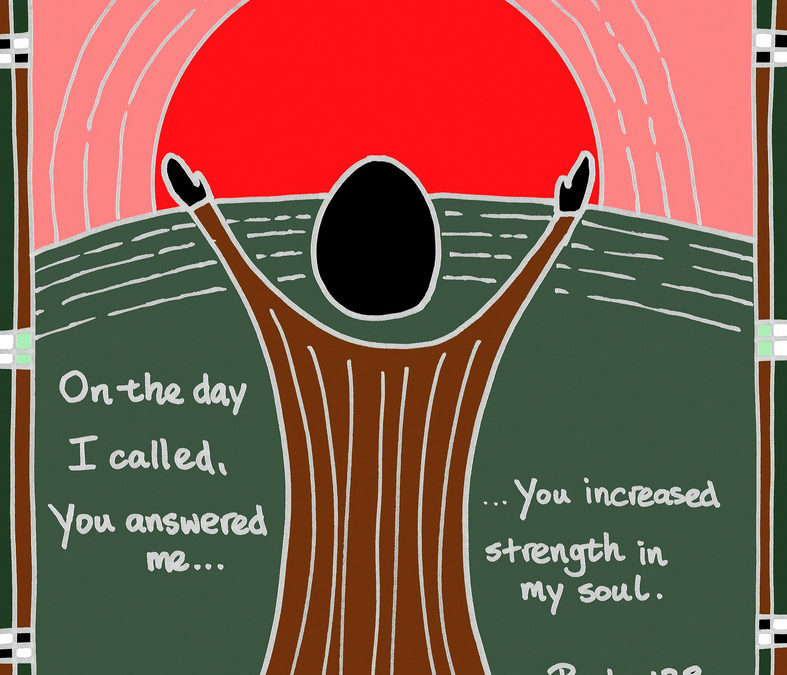 Today’s Bible readings can be found here: Psalm 139:13-24 and Luke 11:1-23. When I was twelve years old, my mother took a nervous breakdown in front of me. We were sitting in the living room and she just started going crazy, throwing things around her, breaking ornaments and other stuff, cursing loudly and shouting swear words that I had never heard her use before. It was a traumatic event for my youngest brother and me, who were the only two witnesses. It was also the beginning of decades of mental illness that saw her in and out of locked hospital wards for many months each year. My Dad, as well as my siblings, did not know what to do. It felt shameful to us and we worried about catching the same thing. We didn’t ask for help and we didn’t share it with anyone outside of our extended family and most trustworthy of neighbors. We individually carried our burdens within our own hearts and minds, didn’t talk much about it, and just sought to survive the whole experience. When I look back on those tragic events now, I wish we had asked for help, good counsel, and guidance. We were so fiercely independent and stubbornly proud which caused us to become locked in the past and unable to truly cope with my mom’s illness. In my case, I ended up as an alcoholic and only survived an overdose because of the quick intervention of dear friends. I now believe that if our family had all been properly counseled and learned to trust skilled professionals, my life, as well as those of my siblings, would have been addiction-free. I think this is why Jesus tells His followers to ask God for help. We tend to use today’s highlighted verses as a positive opportunity to get what we want. However, I now think it’s much more than that: Jesus is telling us to ask God for what we really need: help, healing, and direction. Christ is saying to us that God can unlock the door to our future health and happiness, just by asking for help. It’s a wonderful promise which can become a channel of deep and profound blessing in our lives. Wherever you are today and whatever you are going through, please don’t carry your burdens alone. In my opinion and experience, churches are safe places full of good people with compassionate hearts and professional skills that can make a great difference in the healing of our lives. All we have to do is simply ask for what help we truly need. Points to ponder: What issues am I currently facing? What burdens am I still carrying? Am I willing to ask Christ for help? Am I ready to ask someone I can trust for support and guidance? Prayer: Lord Jesus, too often we think that we are strong, don’t need help, and can deal with our own issues. Enable us to stop disabling ourselves by reaching out to others who can offer us patience and help, understanding and compassion. In Your Holy Name, we humbly pray. Amen. 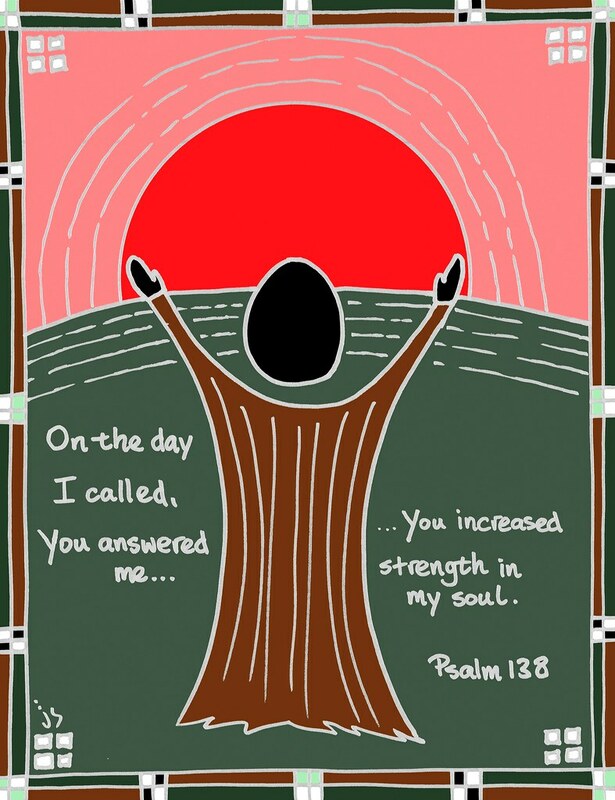 Today’s image is one of John’s latest psalm drawings based on a verse from Psalm 138. If you would like to view a larger version, please click here.